Grow an outdoor herb garden without the need for a dedicated garden bed. An outdoor potted garden is adaptable to the space you have. Place the pots on a patio or balcony, or in any location that receives ample sunlight and is easily accessible. Most common kitchen herbs grow well in pots. Some herbs, such as mint, are mildly invasive so pot culture is preferable to planting them in a bed. 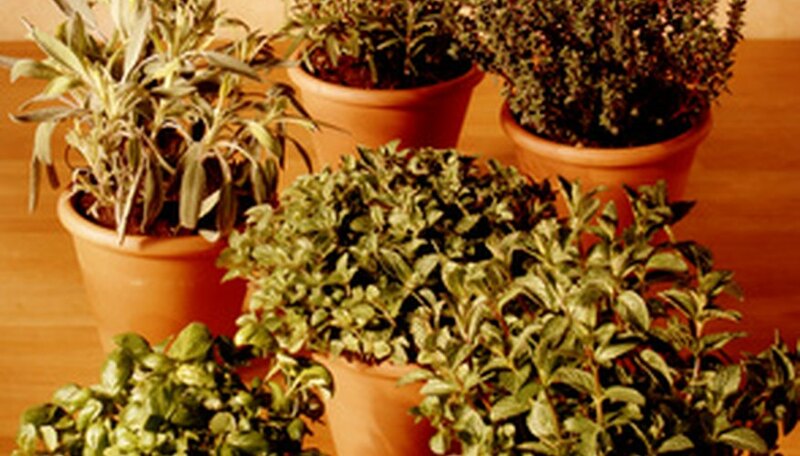 Start your potted herb garden outside in spring once frost danger is over in your area. Fill 6- to 8-inch diameter pots with a moist potting soil to within 1 inch of the rim. Use pots that have at least one drainage hole in the bottom so that the soil does not become waterlogged. Plant one herb plant per pot. Plant the herbs at the same depth in the pot that they are growing at in their nursery pots. Firm the soil around the plants with your hands after planting. Set the pots in an area that receives at least six hours of sunlight a day. Many herbs grow best in areas that receive morning sun and afternoon shade. Check the soil moisture in the pots daily. Water when the top 1 inch of soil begins to feel dry. Water from the top of the pot until the excess moisture begins to drain from the bottom of the pot. Outdoor pots tend to dry out more quickly than garden beds. Fertilize potted herb plants once monthly. Use a half-strength liquid houseplant food, following the application instructions on the package. Plant herbs in window boxes or hanging baskets if you do not have room for traditional pots. Do not overfertilize herbs. These plants usually require very few nutrients in order to thrive. Overfertilizing may ruin the flavor of the herbs or kill the plants. Jenny Harrington has been a freelance writer since 2006. Her published articles have appeared in various print and online publications. Previously, she owned her own business, selling handmade items online, wholesale and at crafts fairs. Harrington's specialties include small business information, crafting, decorating and gardening. Do Geraniums Need Full Sun All Day?